As economic experts forecast a solid figure of 8 per cent growth in China’s economy, Beijing strategists are also expressing optimism about the strengthening of its middle class and growth in wealth in rural areas. Last week, the Ministry of Commerce said that despite the global economic crisis, domestic consumption and investment in China remained steady. 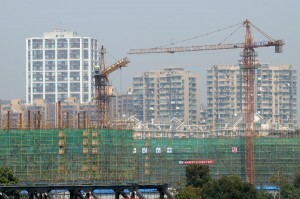 This helped maintain the momentum of China’s booming construction industry. The growth in rural wealth is also due to China’s urbanisation policies; migrant workers have been able to pay more thanks to jobs on construction sites of emerging mid-size cities. Poly Real Estate Group, China’s second-largest property developer, has reported a profit surge for last year. The developer’s profits increased 28.69 per cent from a year earlier to 8.41 billion yuan ($1.34 billion) in 2012, Poly said in a preliminary financial statement released last week. The continued growth in the construction industry is part of China’s economic strategy while it emerges as the global business engine. The Central Economic Work Conference, China’s most important economic policy meeting, held last December, determined that China would look inward during 2013 and focus on increasing domestic demand, focusing on the capital market and real estate sectors. “China will put job creation and people’s livelihood on top of the agenda. It will increase input into rural development, education, services, health, social security, job creation, environmental protection and technological innovation,” a China Central Television (CCTV) report said at the time. In figures recently released by the National Bureau of Statistics, and carried by Bloomberg News, “rural per-capita net income advanced 10.7 per cent, compared with 9.6 per cent for urban dwellers, partly on the rise in migrant labourers and their wages”. The figures seem to fall in line with last December’s Conference – government focus on rural areas has seen benefits payments surge by 21.9 per cent there, outpacing similar remuneration in urban areas, and health-care spending there has increased by more than 30 per cent in 2012. This marks a three-year trend in which rural per-capita income was higher than in urban areas. Jim O’Neill, the chairman of Goldman Sachs Assets Management who coined the term BRICS more than a decade ago, says China’s best path is to continue focusing on domestic consumption which enlarges and solidifies the middle class and spreads wealth to the rural areas. O’Neill predicts that China’s economic strategy will prioritise consumerism and healthcare over heavy industry.